Usually we do cream cheese and strawberries, but last time we had some nutella and cream cheese and that was really good. We love crepes! Each boy wants a different filling: strawberry jam, bananas and honey, chocolate peanut butter. Your recipe looks so easy, but I don’t know if I could use 18 eggs in one sitting without crying. Actually, traditional crepe recipes use only 2 or 3 eggs, plus milk, flour, etc. I have been meaning to introduce crepes to my girls this summer. I plan to serve them with garden fresh strawberries and whipped cream like we had growing up. I have never made them with whole wheat flour, but there is a first time for everything. Cream cheese and blueberries. Or raspberries, blackberries, strawberries in a pinch. Oh, Nutella. . I am wondering if you could use whole milk and some coconut oil in place of the whippin cream? If so, what would the ratio be do you think? I would like to have an easy quick recipe like this compared to the one I have that uses milk and flour too. Thanks for sharing this recipe. Wheat free-Yay!! I usually feed wheat to my kids but I can enjoy these, too :) My kids grew up on Swedish pancakes and have been begging for them(instead of loving my German Pancakes weekly using oats instead of wheat). These should pass for Swedish Pancakes. They will be thrilled. Thanks. I love filling crepes with fruit and cream, sometimes some cream cheese or mascarpone if I feel indulgent. If you buy them at a creperies, they are made on a special crepe pan and are 18 inches in diameter. They literally take seconds to cook, and then they add your choice of fruit and fold them up just so. So good- some of the best things you will ever eat. No flour? This is a dream come true! We just started a low carb diet, and minus the jelly, this fits! Taken originally from a GAPS recipe, we blend together the eggs with bananas and cinnamon. 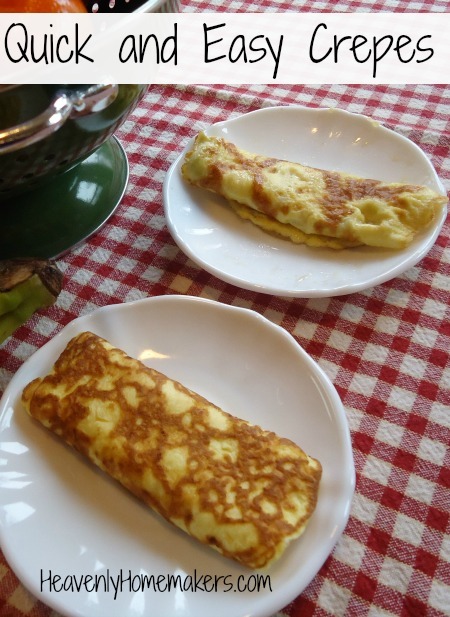 It makes them nice and thin and soft and not quite as much like an omelet and then top and fold with sour cream. Our strawberry patch has yeilded us oodles of berries :) I’m thinking these would be awesome with strawberries and cream cheese…with fresh whipped cream on top. My people have to have bacon or sausage, so I’ll be adding that also. I’m thinking crepes, it’s what’s for dinner! I couldn’t help but laugh at the grape conversation and how willing your boy was to eat only grapes for breakfast – just was concerned if he’d be full. I love how he trusted your ‘grape’ meal selection just doubted the quantity! What a joy! Oops! Reading it over – he did question your meal choice but still I wonder what my kids perception of our whole food journey will be when their older. They might recall some dinners seeming like just grapes compared to the processed foods of others. But sometimes just grapes would be the best choice. So yummy! Bet he was glad when you clarified they were crepes though. We used to often eat them for dinner with savory fillings as a quick meal. Thanks for the reminder! My crepe recipe is more like pancakes than eggs — like really thin pancake batter. We wrap our crepes around a banana and drizzle with a little nutella. We also make a more savory version with peppers, caramelized onions, sausage, and cheese. Love the idea of such a simple recipe, we usually do the more traditional crepe recipe with flour, butter, etc. This sounds good! We usually top with strawberries/bananas/whipped cream/syrup (whatever we have on hand), but I also LOVE savory crepes… most recently made a chicken pot pie filling and put inside & baked (almost like enchiladas). I made these today for breakfast. It took literally 19 minutes from pulling out all the ingredients to plating. Amazing! We made your cream cheese filling and sweetened it with honey and a tiny bit of unsweetened cocoa powder. So decadent for being healthy and sugar free!! We also used the sliced strawberries inside and on top, drizzled with a little more honey. Holy moly were these delicious!! I’m so happy with how easy these were to make. Thank you for another winner recipe!! Because these are more eggy and less cakey, I would prefer a savory filling like baccon, cream chees and green chilis or something. HMMM, may b on to something there!